Forestry Research Insitute of Malaysia FRIM surrounded by the Bukit Lagong Forest Reserve, a 600 ha jungle park at Kepong; just 16km northwest of Kuala Lumpur ( about 10 mins from Batu Caves by car). FRIM offers all walks of life a back-to-nature experience whilst enjoying the flora, fauna, landscapes and the remains of an old Orang Asli settlement. A waterfall and river cutting through this forest reserve adds serenity to this luxuriant landscape. The main highlight in FRIM is the Canopy Walk (adult/ child RM 5/3; Opening Tue-Sat & 2nd Sun of each month; Tel: 6279 7220); advance booking is necessary (limited to 250 people per day). 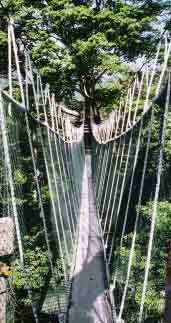 The canopy walkway was built in 1992 on the hillside and spans for about 200 meters. The entire walkway consists of 4 bridges suspended from tree to tree by an elaborate array of ropes. The walkways are just planks hardly a foot wide placed on aluminium ladders supported by the ropes. These 4 bridges are connected by 3 platforms as high as 30 meters from the ground. A word of caution, be prepared! Mentally and physically. The hike up the canopy walk may be streneous to many; it is an uphill hike most of the way. Tip 1: Bring along water and dress appropriately; light cool clothing is recommended as it gets very hot and humid in the jungle, and good walking shoes or hiking boots is a definite must. At FRIM, camping is available for those wanting to experience a night in the wilderness but prior permission is required.